On a sunny winter day this January I made my way to the United Methodist Building in Washington, DC. Situated on Capitol Hill, the UM Building houses the offices of the General Board of Church and Society. I was there to participate in the Consultation on the Social Principles. The purpose of the consultation was to consider a process to make the United Methodist Social Principles more succinct, theologically founded and globally relevant. The consultations are a preliminary step to develop a recommendation to the 2016 United Methodist General Conference for a process that will lead to a proposal to the 2020 General Conference to update the Social Principles. There were four consultations held, two in the United States, one in Europe and one on the African continent. Each consultation comprised about 20 persons and lasted two days. Attending the first of the United States consultations, I met folks from throughout the connection as well as observers from denominational offices and caucuses. What might globally-relevant Social Principles look like? Our conversations began with one person presenting an overview and reflection on a specific section (“The Nurturing Community,” for example). After hearing this presentation, we broke into small groups for discussion on assigned topics within the section, considering the three questions of the consultation. Our small group discussed topics including food safety, adoption, genetic technology, corporate responsibility, and restorative justice, among others. After the small group work, the larger group gathered to hear from each discussion group and identify answers to the three questions. Susan Brown at Consultation on the Social Principles. I was invited to present an overview and reflection on “The Economic Community” section of the Social Principles. I shared some of the economic history of our state and present-day statistics, including the more than $100 million that comes into Ohio from The Ohio State University Athletic Program (the consultation was just a couple of days after the championship game). 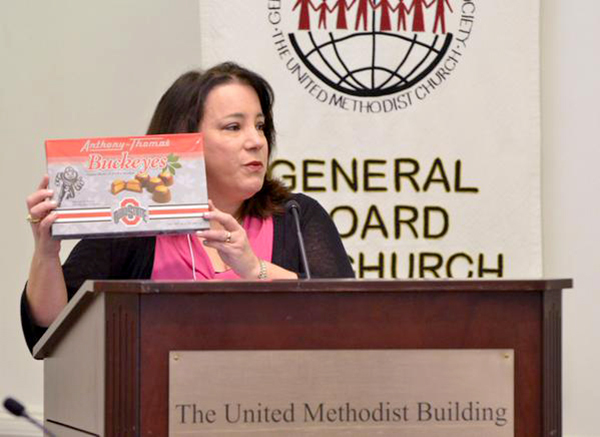 In a specific connection to the consultation’s goals, I described the work done by Ohio churches and conferences in witnessing against the expansion of gambling in the state, work inspired by the Social Principles. Most small groups struggled to offer ways that the Social Principles enhance or empower ministry in the local church. Most folks agreed that we turn to the Social Principle when a situation or question arises, but don’t often use them to inspire ministry. Much of the small group discussion focused on individual preferences about the topic. “I like this,” “I don’t agree with that.” It was sometimes hard to focus the conversation on the questions because there is so much personal engagement with an issue. I was surprised to realize how often the topics of the Social Principles are in response to situations and events of modern American history (such as weaponizing space). I began to realize that there is much language and vocabulary that would not be familiar or relevant to the global community. We had some interesting semantic conversations around words and phrases such as “third world,” “global”, and “political.” It was interesting to learn the positive and/or negative perspectives on these words depending on geographic and cultural contexts. We did not come to any definitive answers to the three questions that were considered, however, we did come to consensus about a possible future form of the Social Principles. We mostly agreed that the Social Principles would be best presented as a set of values or principles rather than detailed paragraphs of “do’s and do not’s.” We expressed the hope that the Social Principles would be presented as aspirational, a vision of the Kingdom to come. You can read other thoughts about the Consultation on the Social Principles on Twitter at #spconsults. *Rev. Susan Brown is in her 3rd year as pastor of Canfield United Methodist Church (Mahoning Valley District). Next postIda is a beautiful gem of a film with a five halo rating.